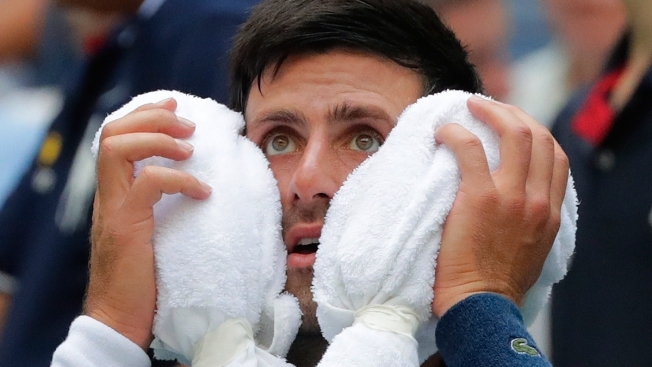 Novak Djokovic, of Serbia, puts an ice towel to his face during a changeover in his match against Marton Fucsovics, of Hungary, during the first round of the U.S. Open tennis tournament, Tuesday, Aug. 28, 2018, in New York. His cheeks red, hair matted with sweat, Novak Djokovic appeared to be in such distress as he trudged to a changeover on a steamy U.S. Open afternoon that someone suggested it would be a good idea to have a trash can at the ready, just in case he lost his lunch. Djokovic sat down and removed his shirt. He guzzled water from a plastic bottle. He placed one cold towel around his neck, a second across his lap and a third between his bare upper back and the seat. He was not even 1½ hours into his first match at Flushing Meadows in two years, and while Djokovic eventually would get past Marton Fucsovics 6-3, 3-6, 6-4, 6-0 Tuesday, it was a bit of an ordeal. "Survival mode," Djokovic called it. With the temperature topping 95 degrees (33 Celsius) and the humidity approaching 50 percent — and that combination making it feel more like 105 (40 C) — nearly everything became a struggle for every player across the grounds on Day 2 of the U.S. Open, so much so that no fewer than six quit their matches, with five citing cramps or heat exhaustion. About 2 hours into the day's schedule, the U.S. Tennis Association decided to do something it never had at this tournament: offer men the chance to take a 10-minute break before the fourth set if a match went that far. That is similar to the existing rule for women, which allows for 10 minutes of rest before a third set when there is excessive heat. The whole thing raised several questions: Should the genders have the same rules moving forward? Should the U.S. Open avoid having matches during the hottest part of the day, not just for the players' sake but also to help spectators? Should the men play best-of-three-set matches at majors, instead of best-of-five? Should the 25-second serve clock, making its Grand Slam debut here, be shut off to let players have more time to recover between points? "At the end of the day, the ATP or a lot of the supervisors, they're kind of sitting in their offices, where (there's) an A.C. system on, where it's cool. And we have to be out there. They tell us it's fine; they're not the ones playing," said No. 4 seed Alexander Zverev, who won in straight sets in the early evening, when it was far less harsh. "For sure, the rule should be more strict. There should be a certain temperature, certain conditions where we shouldn't be playing." How bad was it out there at its worst Tuesday? "Bloody hot," said two-time major semifinalist Johanna Konta, who lost 6-2, 6-2 to No. 6 Caroline Garcia. "Brutal," said 2014 U.S. Open champion Marin Cilic, who advanced when his opponent retired in the third set. "Really not easy," said three-time Grand Slam title winner Angelique Kerber, who defeated Margarita Gasparyan 7-6 (5), 6-3. "Terrible. It's awful out there," said Tennys Sandgren, an American who won in straight sets and will face Djokovic in the second round. "I don't know how guys are hanging in there. I was thinking in the third set, like, 'It's getting really bad. I just don't know how long I have to play out there.' And I think everybody kind of feels similarly." "Everything is boiling — in your body, the brain, everything," said Djokovic, who's won two of his 13 Grand Slam titles in New York but sat out last year's U.S. Open because of an injured right elbow. He is a popular pick to hoist the trophy again, coming off a Wimbledon title in July and a victory over Roger Federer in the final of the hard-court Cincinnati Masters in August. Federer was among those lucky enough to play a night match Tuesday, beating Yoshihito Nishioka of Japan 6-2, 6-2, 6-4. Federer's third-round opponent could be the entertaining, if mercurial, Nick Kyrgios, the 30th-seeded Australian who had 25 aces and 14 double-faults while defeating Radu Albot 7-5, 2-6, 6-4, 6-2. In the last match on Ashe, 2017 runner-up Madison Keys advanced with a 6-4, 6-4 victory over 71st-ranked Pauline Parmentier of France. The final match of Day 2 was in Louis Armstrong Stadium, where five-time major champion Maria Sharapova got past 39-year-old Patty Schnyder 6-2, 7-6 (6). Schnyder, who retired in 2011 but is now back on tour, was the oldest woman to qualify for a Grand Slam tournament. Djokovic was appreciative of the chance for a chance to recover a bit after the third set. He even took about a minute for a quick ice bath — as did Fucsovics, nearby. "Naked in the ice baths, next to each other," Djokovic said. "It was quite a magnificent feeling, I must say." Because action began at 11 a.m., and the USTA implemented the heat rule for men at about 1 p.m., those playing in the earliest matches weren't able to get that sort of relief. That included Italy's Stefano Travaglia, who quit in the fourth set of his match after feeling dizzy and cramps. Afterward, he said, he could barely walk. "My head was spinning. ... I didn't have any energy. I saw four balls when I swung. It was a terrible feeling. I couldn't stay on court," he said. "There was no sense in continuing. Things probably would have gotten worse. I probably would have hurt myself." Travaglia also thought it wasn't fair that the USTA's decision to offer the 10-minute breaks came too late for him. "We all should play with the same rules in this sport. Unfortunately, they don't ask (players) anything, and they decide," he said. "If they're going to have a break, they need to say so in the morning, before matches begin — not after I almost was going to pass out because my blood pressure was so low."